I indeed baptize you with water unto repentance: but He that cometh after me is mightier than I, whose shoes I am not worthy to bear: He shall baptize you with the Holy Ghost, and with fire: Whose fan is in His hand, and He will thoroughly purge His floor, and gather His wheat into the garner; but He will burn up the chaff with unquenchable fire. The picture is painting prayer. 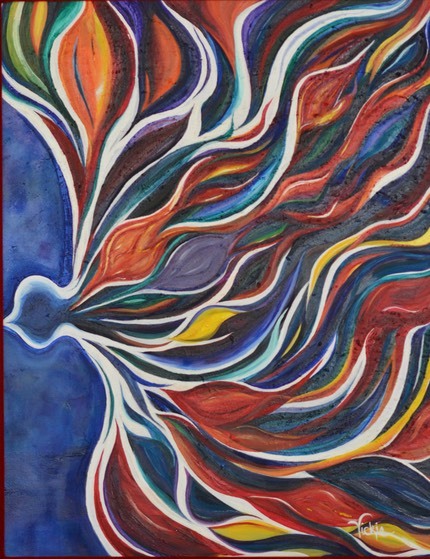 The process of painting came as the Holy Spirit moved in my heart, mind and hand to pray for His love to rain down and bring healing to each of us. Each brush stroke was a prayer to Our Father in heaven to have His kingdom reign in all areas of our lives. Especially the areas where each one of us struggle with believing “He is God”. Each stroke was a cry out to Him to heal our broken places. At first the dove was small and descending quickly as a comet might soar through space. I knew it was wrong. Jesus did not do a light clean-up in our lives, but make us new creatures in Christ. The old is gone the new has come. There is a television show called the “New Home Makeover”. In this show each week a group of people come in a tear down the old home and completely remake a brand new one. The heart of the home is made into a truly beautiful and livable place. That is what the Holy Spirit does; He takes out our stony hearts of sin and gives us a heart of love. The Holy Spirit comes in and transforms us continually making us more into the image of Christ. The Father So Loved He Sent His Only Begotten Son, The Son sent the Holy Spirit to be with us internally so we would not be left alone. He sent the Comforter to heal us, to teach us, to show us the way to walk and to walk with us. We were never meant to change ourselves into the image of Christ. God began the work, He has given us the power to will and to act, and He is faithful to complete all the work He started. We are given the power to work out with Him our salvation. Jesus came to save, heal, deliver, empower, and complete us. The Holy Spirit did not leave us alone to accomplish God’s will. Instead we are given a Spirit of a sound mind that does not give into fear. We can face life’s most difficult trials and know that it is Christ working in us to free us from our greatest fears. In this painting the Holy Spirit is not a “Casper the friendly ghost”. It is a fiery, intense, intimate, redemptive, restorative, deliverer who comes into us where we need Him the most. Jesus comes into the areas in our life where we suffer from our greatest sin, fear, guilt, shame and condemnation. Jesus came to bring us the Truth, the Way, and the Life, His Abundant Life. Jesus Himself wants us to be empowered by His Spirit to be more than conquerors, living a life full of love and Holy passion. This painting prayer is for all of us who have experienced temptation and sin, loss and rejection, abuse and failure. Each stroke is a prayer for the Holy Spirit to permeate our weakness and impute His strength. To free us from our unbelief and pour out His Spirit with hope in God. God’s pleasure and desire (His will) is that we truly are comforted in our sorrow, and know that He has already bore all the sin of the world, individually and corporately. There is nothing that has escaped His watch. He misses nothing, and wants that we come to Him. His provision is for all our sorrows, addictions, abortions, adulteries, and abuses. His Love has overcome. There is NOTHING too difficult for Him to heal. No hurt too deep, no shame to dirty, no sin too big for Jesus to remove. God’s love ignites His Holy Fire within us to burn off the ungodliness that we bear, and to bring us closer to His Holiness. The Power of God’s Love to transform us into His image is more than we can imagine, hope or ask for. The Holy Spirit desires that we become filled, and impassioned with His Fiery Love that burns continually within us for an intimate relationship with Him. The heart that burns for God pleases Him. Today we pray that You would burn away the areas in our lives that You know is the best for You and I.